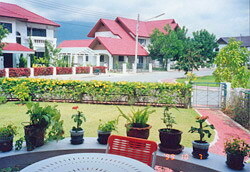 This was our first rented accommodation in Thailand. 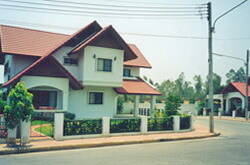 Located on a housing estate, just 15 kilometers south of Chiang Mai air port. It has a very small front garden, and a few meter at the rear. Any chance of a tower meant that it would have to tilt down across the road. Although the house was a new build, it was in many ways not suitable, for one, there was no storage space whatsoever, and my wife disliked the open plan kitchen. Eventually the owner would not drop the rent to a reasonable price. This is just another view of the same house. Looking out from the patio to across the road.